« Stay Rad Wine Blog TV Episode 156: How’s Your Vertical? There’s nothing really out of the ordinary about that. My uncle and I have been to a lot of hockey, football, and baseball games together. 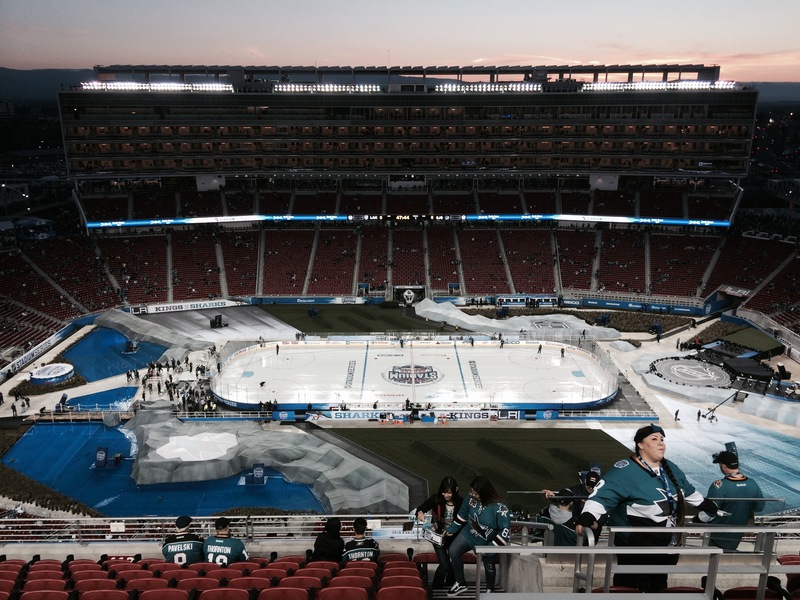 What made last night special was that the hockey game, in which my San Jose Sharks hosted the L.A. Kings, was played at Levi’s Stadium, home of my San Francisco 49ers, as part of the NHL Stadium Series. Levi’s Stadium: Home of the Sharks? I’m not going to get into the details of what happened in the game. Who cares if the stupid Kings won? This blog is about wine, right? Wine and a Frank. One of these things cost $11. 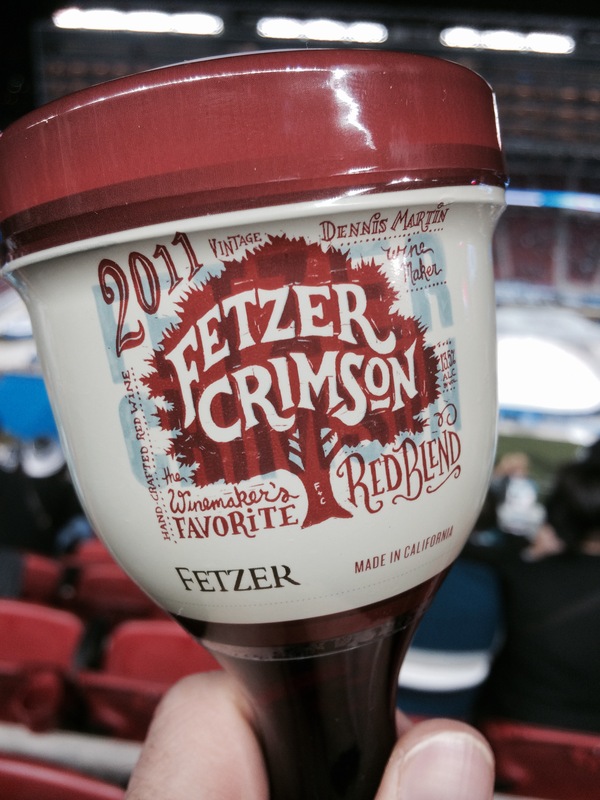 This red blend from Fetzer comes in a 187 ml (just over 6 ounces) Zipz cup. Perfect for a stadium environment, the individual plastic cup has a resealable lid, so you don’t have to worry about spilling it everywhere when you’re carrying it back to your seat. It’s $11 at the stadium, and available in stores from $3 – $6. Nose: Nice! Notes of cranberry, orange juice, and a little lime zest. On some level, this wine reminds me of a young, thinned out version of a Chateauneuf-du-Pape. 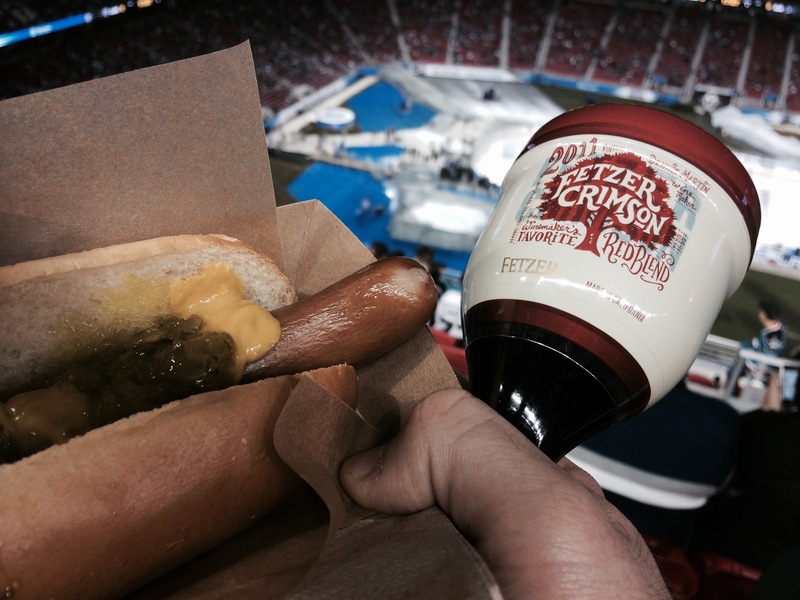 Taste: The Fetzer Crimson is a blend of Zinfandel, Syrah, and Cabernet Sauvignon (along with some other stuff). It’s very fresh on the palate. Bright notes of cranberry and raspberry fruit. There is a nice richness to this wine, though it may, in part, be due the the plastic vessel I drank it from. Score: Not bad! This wine is what it is. A nice, fresh, red wine that comes in a plastic cup. I can’t really get mad at the $11 price point. You’re never going to find your favorite cult wine in a plastic cup at a hockey game… or if you did, you’d pay through the (wine covered) nose for it. I’m giving it an 83. You could be a Kings fan. We want to hear from you. Let us know how you feel about wine in plastic cups. Leave your comments below. This entry was posted on February 22, 2015 at 10:28 am and is filed under Food and Wine, Wine, Wine Events. You can follow any responses to this entry through the RSS 2.0 feed. You can leave a response, or trackback from your own site.